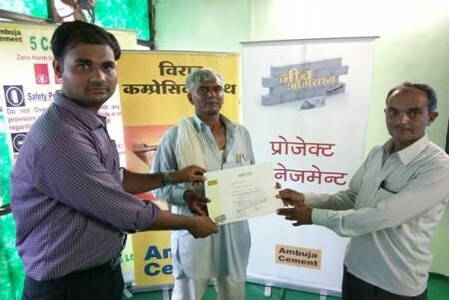 Ambuja Cements Ltd has been promoting sustainable construction practices in India through its ‘Neev Abhiyan’ initiative, which imparts formal training to upskill masons and contractors by strengthening their knowledge-base and technical skill-sets through certified training modules and value-added services. The company’s Technical Services team has organised numerous workshops since 2017 and reached out to about 41 000 contractors and masons. The programme is also helping in addressing the growing demand for trained masons and contractors required by the rapidly growing construction sector in India. “At a time when sustainable construction is gaining momentum in the country, the enhanced knowledge, expertise and capability of the construction professionals because of this programme are enabling them gain competitive edge. Moreover, whenever these professionals face any challenges, they approach us for solutions,” added Soni. Ambuja Cement has created its own curriculum for the programme. This includes six training modules - Project Management, Steel Estimation & Detailing, Estimation & Costing, Repair & Waterproofing, Building Earthquake Resistant Structures and Rainwater Harvesting. The training involves classroom as well as field sessions with an enhanced focus on knowledge application. A team of over 200 engineers has opened opportunities to thousands of contractors, architects, builders and engineers through the programme. The team is also engaged with 3300 construction professionals (Architects & Engineers) in the same period through technical sessions/lectures at its 29 Ambuja Knowledge Centres (AKCs), which provide a platform to share information, create interaction and stimulate creative thinking to the Architects, Engineers and Construction (AEC) community while encouraging innovation in the field of cement, concrete, construction technology and civil engineering.